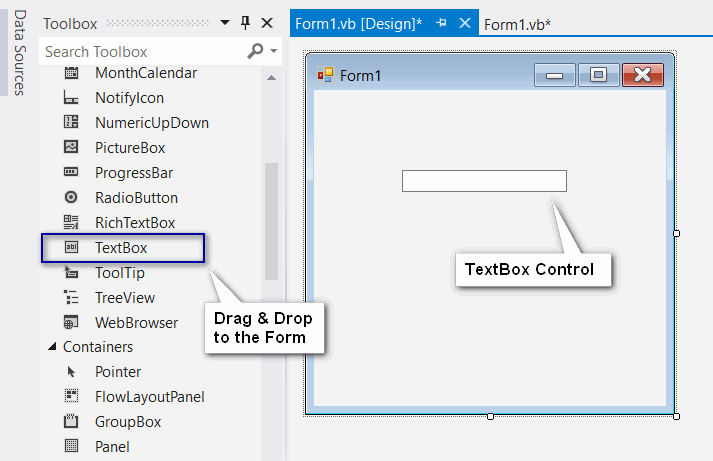 TextBox in the .Net applications are like the input box both have the input fields to insert data. The TextBox can either input the single line text or the multi-line texts. TextBox control allows entering text at the runtime of the programs. From the toolbox drag & drop the text box control to the form. You may accept the values from TextBox as shown below. The following table shows the popular using TextBox control properties. ScrollBars This property is used to specify vertical and horizontal scroll bars. MaxLength Property used to specify the maximum number of characters accepted by a TextBox Control. Enabled Property used to enable a textbox control. Index Property used to specify the index of a control array. Readonly Property is set to true to use the control, false the control cannot be used. SelectionLength Property is used set or get the number of characters selected in the text box. SelectionStart Property is used set or get the starting point of a text box. SelectedText Property is used for indicating the currently selected text box. The following table shows the most used TextBox Control methods. AppendText Appends text to the current text of a text box. Clear Clears all text from the text box control. Copy Copies the current selection in the text box to the Clipboard. Cut Moves the current selection in the text box to the Clipboard. Paste Replaces the current selection in the text box with the contents of the Clipboard. Paste(String) Sets the selected text to the specified text without clearing the undo buffer. ResetText Resets the Text property to its default value. ToString Returns a string that represents the TextBoxBase control. Undo Undoes the last edit operation in the text box. The following table shows the common events of TextBox control. Click Occurs when the control is clicked. DoubleClick Occurs when the control is double-clicked. TextAlignChanged Occurs when the TextAlign property value changes.